In addition to staying informed about potential campus closings or delays if the weather turns severe, winter weather also offers the opportunity to be mindful of general safety procedures. Even if the university is open for business after a snow or ice event, many areas may still be icy, so extreme caution must be exercised to avoid potential injury. Wear shoes with large treads or a raised pattern. Limit travel to main roads and walkways that have been cleared of ice and/or snow. Use caution on bridges and stairs. Always cross at designated crosswalks. Stay out of cordoned off areas for your safety. Stay clear from the edges of buildings and tree branches (debris and falling ice hazards). Walk slowly and bend your knees slightly when navigating icy paths. Yield to and use caution around snow removal equipment. Campus Services will offer 24-hour coverage to keep entrances accessible as long as the air temperature is above 10 degrees F and the wind chill factor is above 0 degrees F.
When the temperature rises above freezing and icicles form on the eaves and gutters on buildings taller than two stories, Campus Services personnel will cordon off the immediate area surrounding the building to warn pedestrians of the hazards of falling ice. If this affects the main entrance to the facility, signs will be posted directing patrons to an alternate entrance. For hourly updates on the progress of the snow/ice removal activities, follow Emory Campus Services on Twitter at @EmoryCampServ. 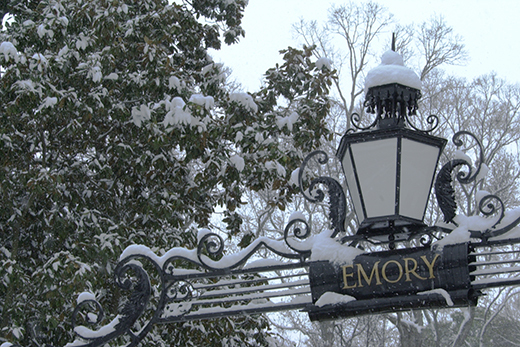 For information about possible closings and delays, call Emory’s Weather Information Line at 404-727-1234. Read more about the university's inclement weather policy.